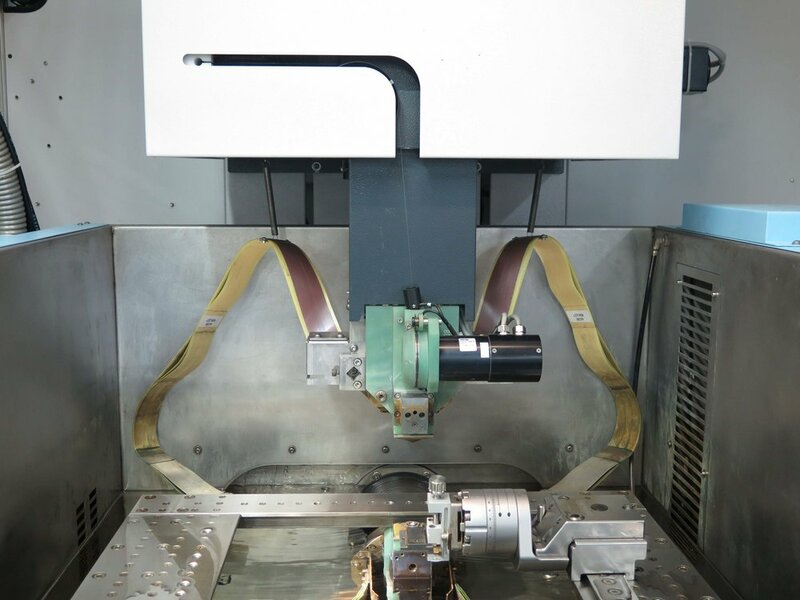 Electrical discharge machining (EDM), also known as spark machining, spark eroding, burning, die sinking, wire burning or wire erosion, is a manufacturing process whereby a desired shape is obtained by using electrical discharges (sparks). Material is removed from the workpiece by a series of rapidly recurring current discharges between two electrodes, separated by a dielectric liquid and subject to an electric voltage. One of the electrodes is called the tool-electrode, or simply the "tool" or "electrode," while the other is called the workpiece-electrode, or "workpiece." The process depends upon the tool and workpiece not making actual contact. When the voltage between the two electrodes is increased, the intensity of the electric field in the volume between the electrodes becomes greater than the strength of the dielectric (at least in some places), which breaks down, allowing current to flow between the two electrodes. This phenomenon is the same as the breakdown of a capacitor (condenser) (see also breakdown voltage). As a result, material is removed from the electrodes. Once the current stops (or is stopped, depending on the type of generator), new liquid dielectric is usually conveyed into the inter-electrode volume, enabling the solid particles (debris) to be carried away and the insulating properties of the dielectric to be restored. Adding new liquid dielectric in the inter-electrode volume is commonly referred to as "flushing." Also, after a current flow, the difference of potential between the electrodes is restored to what it was before the breakdown, so that a new liquid dielectric breakdown can occur. -Wikipedia. Originally this technology was used to cut components from stacks of plates clamped together. Today it is rarely used to make components but is commonly used for making the stamping dies that are used in the next section, stamping. An example of a machined piece of tungsten carbide. The male and female tools cut out of tungsten carbide to be used to stamp out the date discs. The wire can be seen that cuts the metal in the centre of the image.